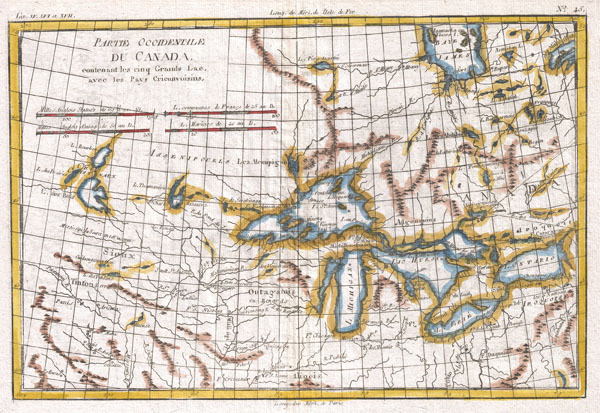 A fine example of Rigobert Bonne and Guilleme Raynal's 1780 map of the Great Lakes and upper Mississippi Valley. A map of considerable importance, this chart was constructed during a period of aggressive exploration into this region. Explorers, seeking a 'westward passage' to the Pacific, believed an inland water route was not only reasonable, but highly likely. With no concept that the vast barrier of the Rocky Mountains stood in their way, they mapped out the likely courses for this route, as depicted on this map. They believed one could pass through the Great Lakes and, roughly following the current US-Canada border, pass upriver to Rainey Lake (L. Tecamamiouen)and then, through another River, to the Lake of the Woods (Lac des Bois), then, via another river, to (though it does not appear on this map) Lake Winnipeg. Here the water route westward ends - though at the time they didn't know it. Throughout this map, Bonne attempts to document rivers, mountains, forts, and American Indian tribes and villages with the most recent data obtainable. He identifies the lands of the Sioux, the Iroquois (Five Nations), the Algonquians, the Illinois, and many others. Chicago (Chicagou) and Detroit both appear as forts. The Great Lakes are mapped with a rough approximation of accuracy, though Lake Superior does include a number of apocryphal islands including I. Ponchartrain and I. Minong (also known as Phillipeaux). These islands first appeared Bellin's mapping of the region in 1750s and continued to appear until the 1820s. Also of note are the possible headwaters of the Mississippi, which the map describes as 'La Source en est inconnue.' Atlas de Toutes les Parties Connues du Globe Terrestre, Dressé pour l'Histoire Philosophique et Politique des Établissemens et du Commerce des Européens dans les Deux Indes.